The event website provides an online resource where people can read about your event and its speakers, create an account, register for the event, purchase passes, view their session schedule, and more. The following image shows a simplified site map of your event website as your attendees will see it. 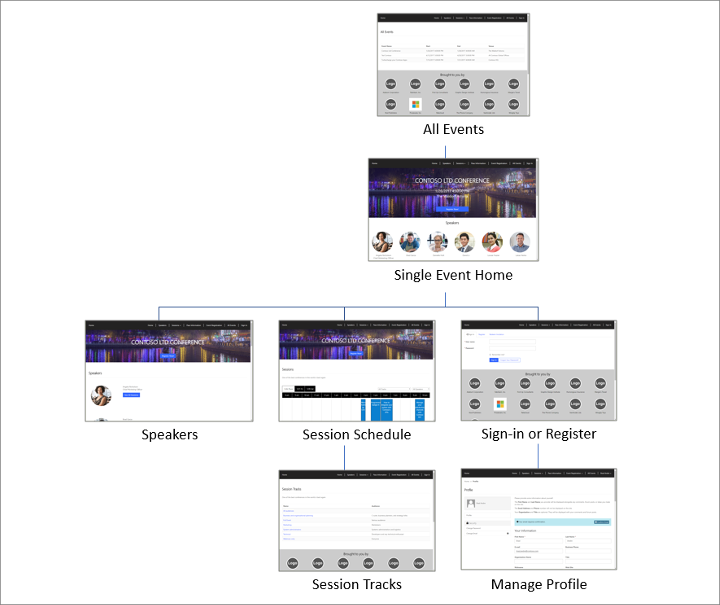 The event site is preconfigured to fetch all the relevant graphics and information for each published event from Dynamics 365 for Marketing, and to enable visitors to create a registration account (including username and password), edit their profile, register themselves and others for an event, choose session passes, view their event schedule, and modify or cancel an event registration. The first time you install Dynamics 365 for Marketing, the event website is installed onto your Dynamics 365 portals solution and is ready to use right out of the box. The website is built using the Angular framework (which makes it easy to customize) and you can choose to host it anywhere (not just on the Dynamics 365 portals solution). The following table describes the hosting options. Link to the event website The URL is generated automatically for each event. Check the Event URL field of the event record to find it. The URL is generated automatically for each event. Check the Event URL field of the event record to find it. The URL depends on where you host the site. You can store the URL in the event record by selecting the Custom event URL check box and then filling in the Event URL field. The first time you install Dynamics 365 for Marketing, the then-current event website is installed onto your Dynamics 365 portals solution and is ready to use right out of the box. The website won't be updated or overwritten when you update Dynamics 365 for Marketing, so you can freely customize the copy that's installed on your portal. However, Microsoft will continue to develop the event website and improve it with with each new release of Dynamics 365 for Marketing, so if you want to take advantage of the latest features, you can always download it, compare it with your own customized site, and add any of the new features that you like. 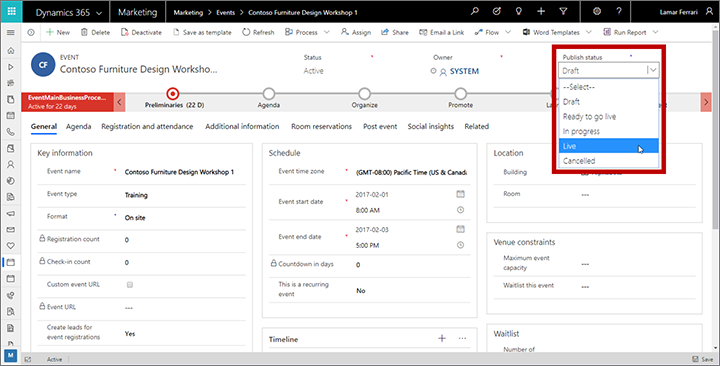 Most of the information shown on the website comes directly from your event models and their various related records, so all you need to do get the website online is make sure that all the information is available in Dynamics 365 and that the event itself, plus its relevant sessions and tracks, are set to be published on the website. To publish an event, session, or track, open the relevant record and set its Publish Status in the drop-down list (usually shown in the upper-right corner of the form) to Published. Set the Publish Status to any other value to unpublish an event, session, or track if needed, thus removing it from your event website. The following table summarizes how to publish each publishable entity to the website, and which types of information are publish for each of them. Be especially careful and thorough when entering values for published fields, because they are exposed to the public. Events Publish each event manually by opening the event record and setting the Publish status to Published. Unpublished events won't be shown on the website. All published events are listed on the All Events page of the website. Sessions Publish each session manually by opening the session record and setting the Publish status to Published. Unpublished sessions won't be shown on the website. Speakers Speakers are published automatically when you publish a session they are assigned to. Speakers are listed on the front page for each event where they are speaking, on the Speakers page, and on session pages for each session they are running. A speaker profile page shows additional details and a schedule of sessions for that speaker. Session Tracks Publish each track manually by opening the track record and setting the Publish status to Published. Unpublished tracks won't be shown on the website. Published external tracks are listed on the Session Tracks page for the event they belong to. Each session track shows its name and a list of sessions that belong to it (with links). You can only publish external tracks (not internal ones). Passes Passes are published automatically when you publish the event they belong to. All passes associated with a published session track are listed on the Pass Information page for the event the track belongs to. The system tracks the number of passes available and the number assigned, and indicates when passes are sold out. Sponsors Sponsors are published automatically when you publish the event they belong to. The website provides several per-event configuration options that you can set up using the relevant event record, without needing to customize the website code. These include graphics, check-out, and payment options. The website features a banner image for each event, and also shows speaker photos and sponsor logos. You can set the banner image shown for any event by editing the event record, going to the General tab and using the Portal image setting. Sponsor images come from each sponsorship record, which you can edit by working in the event record where the sponsorship applies (found on the Agenda tab, which links to related sponsorship records), or by finding the appropriate sponsorship record under Events > Sponsorship management > Sponsorships. As with speaker images, you can edit the image by selecting the existing photo (or generic placeholder) in the heading area of the sponsorship record page. Open the event website and choose an event. The registration page opens. If you've enabled anonymous registration, then the visitor can enter registration details right away, or they can choose to sign in (or to create an account first). If you've disabled anonymous registration, then they must sign in or create an account before they can register anyone. The registration can allow several people to be registered at once, or you can set it to allow just one attendee to be registered at a time. If you've chosen to enable a CAPTCHA, then the visitor must fill out the CAPTCHA field to continue after entering details about each registrant. One advantage of creating a registration account is that those contacts can sign in again to view their event schedules and to cancel registrations if needed. If you are hosting the event website on a Dynamics 365 portal, then visitors who use the site to create a registration account must do so using an email address that doesn't belong to any contact already in your database. If your event requires payment, a payment gateway opens and the visitor must enter their payment details. When payment confirmation is received (or right away, if no payment is required), contact records are matched or created (as required) and registration records are created and linked to each new or existing contact that was entered into the registration form. If you've enabled lead generation for the event, then a new lead record will be generated for each registered contact. Create an account with a third-party payment provider. Customize your event website (or set up the portal) to include a payment page that interacts with your payment provider. More information: Set up online payment for events. Go to Events > Event > Events and then open or create an event. On the General tab of the event form, go to the Key information section. If you want to generate a lead for each contact that gets registered for this event, set Create leads for event registrations to Yes. Enable CAPTCHA: Set to Yes to include a CAPTCHA field on the registration page. Set to No to hide it. This setting works for both portal hosted and externally hosted event websites. Portal payment gateway: If you are hosting the event website on a Dynamics 365 portal, set this to the name of the portal page that you set up to implement a payment gateway. A default or simulated payment page may be used if you leave this setting blank (to disable payment, either customize the site to remove the feature, or don't create any passes for your free events). This setting has no effect if you are hosting your event website externally. Allow anonymous registrations: If you are hosting the event website on a Dynamics 365 portal, set this to No to require all visitors to create an event-website account before they can register themselves or others for an event; set to Yes to allow visitors to register without creating an event-website account. This setting has no effect if you are hosting your event website externally; see Build and host a custom event website for details about how to enable registration accounts on externally hosted sites. Go to the Agenda tab and set the Allow registrants to create their own agenda option to Yes if you want to use session-level registration, or to No to use pass-level registration (with optional online payment). When a new event registration is received, Dynamics 365 for Marketing looks to see if a matching contact record already exists. If a match is found, then a new event registration is created and linked to that contact. If no match is found, a new contact record is created and linked to the new registration record. Your admin can choose to match incoming registrations by email alone; first name and last name; or email, first name, and last name. For details about how to choose your matching strategy, see Event administration. If you choose to enable lead generation for events, then a new lead will also be generated for each registration and linked to the appropriate contact. The system won't attempt to match to an existing lead. To control whether or not to generate new leads for any event, open the event record and set the Create leads for event registrations option to Yes or No. Open the relevant event record. Make sure the Publish status is set to Published. Open the General tab and find the Key information section. The Event URL field here shows the address of the website for this event. This URL is provided automatically if you're using the event website that was installed together with Dynamics 365 for Marketing, but if you're hosting the site somewhere else, you (or another user) must mark the Custom event URL check box and specify this value as required. Select the globe button at the edge of this field to open the URL. <domainAndPath> is the location where you installed the event website on your portal or external site. <ReadableEventID> is a readable ID that was generated the first time you saved the event record (based on the event name). To find this value, open the relevant event record, go to the General tab, scroll to the Website section, where you'll find the Readable event ID. If you leave off this ID then the event website opens to a list of available events.